Deworming drenches are ready-to-use liquid or semiliquid (pastesm gels) formulations for oral administration containing active ingredients that kill parasitic worms of livestock and pets. Dewormers are also called anthelmintics because they kill helminths, the technical name for worms. Drenches are ready-to-use in the sense that the do not need to be diluted or otherwise mixed before usage. Drenches are one of the most common delivery forms of wormers for ruminants (i.e. cattle, sheep and goats), less frequent for pig, and rather scarce for poultry. They are also used for pets, more for cats and puppies than for dogs. Technically there are three major types of drenches: suspensions, solutions and emulsions. Solutions contain an active ingredient that is solved in a liquid. Very much like sugar in water, if the active ingredient is solid; or like alcohol in water, if the active ingredient is a liquid. Suspensions contain an active ingredient as small particles that swim in a liquid. They swim because they are not soluble in the liquid. Very much like sawdust or sand in water. Emulsions contain an active ingredient as small drops that swim in a liquid. They swim because they are not soluble in the liquid. Very much like oil in water. Pastes and gels contain an active ingredient in a semisolid formulation. Whether a drench is a solution, a suspension or an emulsion depends on whether the active ingredient is solid or liquid, and whether it is soluble or not in liquids that can be used as solvents for oral administration to animals (ideally water). Among the anthelmintic active ingredients, some are soluble enough to be formulated as solutions (e.g. macrocyclic lactones, imidazothiazoles, some salicylanilides), others are not (e.g. benzimidazoles). As a rule, soluble active ingredients can also be formulated as injectables, insoluble ones cannot. Most drenches are suspensions because they contain at least one poorly soluble benzimidazole. A few are solutions. Emulsions are rather unusual. For specific information on drenches for dogs and cats click here. Many products contain a mixture of active ingredients, either to cover a broader spectrum of activity, i.e. to control more parasites simultaneously; or to combine different chemical classes in order to overcome resistance of certain worms to anthelmintics, which is very common in sheep and goats and occurs also on cattle. Many drenches contain benzimidazoles that are solid compounds poorly soluble in water. Consequently they are formulated as suspensions. A key unfavorable feature of all suspensions is that the solid particles tend to fall down to the bottom of the container and sediment, very much like sand in water. This means that suspensions must be thoroughly shaken before use. How fast the suspension sediments and how easily shaking the container redistributes the suspension depends on the formulation. A good formulation sediments slowly and shaking will re-suspend it quickly. Bad formulations sediment quickly and shaking re-suspends them slowly. Thorough shaking of suspensions before use is crucial for efficacy. If the active ingredient remains in the sediment, it means that a few animals may get most of the active ingredient and will be overdosed, and the large majority will get almost only solvents and will be underdosed. For those drenches that contain soluble active ingredients, shaking is not crucial. It can happen that the part of the active ingredient crystallizes in the bottom of the container, e.g. if it has been stored for a long time at low temperature, or if the solvents evaporate, which usually should not occur. In this case shaking may re-dissolve part of the active ingredient, but it is often very difficult to get all the crystals dissolved. The spectrum of activity of drenches depends on the active ingredients they contain and on the dose administered. It can happen that a particular product contains an active ingredient that is theoretically effective against certain parasites, but not at the recommended dose for that particular product. Globally, the vast majority of drenches for livestock target mainly parasitic worms: gastrointestinal and pulmonary roundworms (nematodes), gastrointestinal tapeworms (cestodes) and flukes (trematodes). A few drenches are also effective against several external parasites such as lice, mites and myiasis. Macrocyclic lactones: e.g. ivermectin, doramectin, moxidectin. Effective only against roundworms (nematicides) and against some external parasites such as lice, mites and myiases. Salicylanilides: e.g. closantel, rafoxanide, niclosamide. Depending on the active ingredient, effective against a some roundworms, tapeworms or flukes. Others: monepantel. effective against some gastrointestinal roundworms. 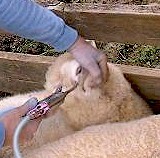 Drenches are administered to livestock using more or less sophisticated so-called drench guns. Basically, administration of drenches to livestock is not complicated, although it is usually needed to restrain the animals, which is obviously easier for sheep and goats than for cattle. In any case it is important to take some precautions in order to prevent errors during administration. This is an absolute must for suspensions. If the product label indicates that you have to shake it, do it as thoroughly as possible. The experience shows that some generic products are especially prone to sedimentation. This must be done before each use, regardless of whether it is a suspension or a solution. This can be done by adjusting the gun to a given amount (e.g. 20 ml) and drenching water from a bucket into a calibrated recipient. If the product is viscous and it is hard to run the drench gun, than it is better to calibrate the gun with the real product, because viscosity can influence both the emptying and the refilling of the gun. As the liquid diminishes in the container, vacuum progressively forms and makes it each time harder to get the next dose drenched. If the container is collapsible, this won't be usually a problem. If it is not collapsible, the container must be opened shortly to allow air to get in and compensate the vacuum. Otherwise the gun may not refill correctly due to such vacuum resistance. Ensure that each animal gets the correct dose corresponding to its weight. Besides correct calibration of the drench gun, correct dosing requires an accurate estimation of the weights of the animals. Be careful with rough estimations based on your eyes and your experience. Best is to group the animals by similar size or age and actually weight a few ones (e.g. 6) within each group. You can use the average weight for dosing the group. Unless you find out that the group was too heterogeneous, i.e., that weight differences between the animals is too high. In this case you may need to revise your groups. It is also important that the drench gun works correctly during the whole drenching process. A typical source of mistakes can be leaking tubes, seals or connections. Stop drenching if bubbles appear in the gun's reservoir and re-adjust the gun to run without forming bubbles. Even after correctly following the use instructions, animals can vomit, cough or otherwise expulse all or part of the administered dose. Sometimes it cannot be prevented, but animals should be monitored after treatment and re-treated if they vomited. However, since it is impossible to know how much an animal vomited and how much it swallowed, check the products label to identify its safety margin to calculate how much product you can administer in a second treatment without risking adverse effects. If the safety margin is 4 or higher, re-treatment should be OK. Be careful if it is smaller than 4. It is important to know that incorrect delivery of liquids through the mouth can bring the liquid into the lungs and not into the stomach, and this can cause fatal pneumonia. Therefore strictly follow the manufacturer's instructions. For benzimidazoles and macrocyclic lactones to be effective it is very important that the administered dose ends up in the rumen (first stomach) and does not go directly into the abomasum (forth or final stomach). This is to make sure that the active ingredient remains enough time in the rumen to reach a concentration that is high enough to kill the parasites. To ensure this, the drench gun must be positioned over the tongue and not in the anterior part of the mouth. Otherwise the "oesophageal groove reflex" could be activated and the animal would swallow the anthelmintic directly into the abomasum. In some countries intraruminal injection is a quite popular delivery form for such anthelmintics to cattle, and many brands are approved for both drenching and intraruminal injection. Correctly done, intraruminal injection is not problematic and prevents the activation of the "oesophageal groove reflex" previously mentioned. It is advisable to reduce the animals' access to feed (especially to fresh pasture, not to water) 24 hours before administration. This slows down the exit flow of the rumen and increases the time that the anthelmintic remains there. This on its turn increases the time that the anthelmintic can be absorbed and keeps it's concentration high enough to kill the parasites. For the same reason, it is better to keep the animals away from food for about 6 hours after drenching. A possible way to do it is to muster the animals in the morning, to let them fast during the whole day and the following night, and to drench them in the morning and than release them to pasture in the afternoon. However sick, weak, or pregnant animals should not be kept away from food. Fasting animals should have access to water. When compared with other delivery forms of anthelmintics such as pour-ons (not available for benzimidazoles! ), oral drenches have the advantage that their efficacy does not depend on weather conditions or on the animals behavior (e.g. licking, going into water, etc. ), and the anthelmintic starts to work immediately after administration. However, delivery through the mouth is certainly less convenient than pouring over the animals back, especially for cattle. If available, injectables are often preferred to drenches: they have the same advantages as drenches, but almost no inconvenient. But most benzimidazoles are not available for injection. Antiparasitic liquid formulations (suspensions, solutions, emulsions) for oral administration to pets are used mainly as dewormers for cats and puppies. In many countries solid formulations (tablets, pills, etc.) are preferred for adult dogs. However, there are also liquid formulations for dogs and solid formulations for cats and puppies. Cats and puppies often accept better liquid formulations that can be easily mixed with food or water. Most drenches are ready-to-use, i.e. they do not need to be diluted or otherwise processed before administration. They are sold either as single-dose vials for a given pet's weight, in pre-charged syringes for multiple dosing, or in small bottles with a dropper. The active ingredients used are basically the same as for livestock, i.e. benzimidazoles, imidazothiazoles, isoquinolines, macrocyclic lactones, salicylanilides and tetrahydropyrimidines. Interestingly, there are a few anthelmintic active ingredients that are used a lot on pet drenches and less on livestock, e.g. oxantel, pyrantel and praziquantel. The specific spectrum of activity of particular products depends on the active ingredients they contain and on the recommended does. Since most pet wormers contain mixtures of various active ingredients, it is very difficult to summarize the various options. Only against roundworms (nematicides) such as Toxocara canis, Toxocara cati, Ancylostoma spp, etc. Contain typically pyrantel, febantel, oxantel, levamisole, fenbendazole, mebendazole, piperazine, etc. Against both roundworms and tapeworms; contain praziquantel and one or more of the nematicides previously mentioned. Only against tapeworms (taenicides), e.g. Dipylidium caninum, Echinococcus granulosus, Taenia spp. Contain almost always praziquantel. Effective as heartworm (Dirofilaria spp) preventatives, with or without efficacy against tapeworms. They always contain a macrocyclic lactones (e.g. ivermectin). There are also a few drenches that are also effective against certain mites and lice species. Flukes (trematodes) are seldom a problem on pets and consequently very few pet products are effective as flukicides. There are currently no drenches that control pet ticks, mosquitoes or flies. Some active ingredients for oral administration are not absorbed from the pet's intestine into the blood. This means that they act only against those worms that are in the intestine. This is the case for several benzimidazoles or tetrahydropyrimidines. Other active ingredients are vastly absorbed, i.e. they are systemic, e.g. most macrocyclic lactones such as ivermectin and milbemycin oxime. Through the blood they reach parasites anywhere in the pet's body, e.g. the heart, the lungs, the kidneys, etc. The mode of action of most active ingredients is influenced by whether they are administered prior, during or after feeding. The use instructions or each product usually indicate this, and it is important to follow such instructions. Otherwise their efficacy can be reduced or the pets may suffer adverse drug reactions. Resistance of parasitic worms of pets to anthelmintics is not a great issue. There are reports on resistant strains of Ancylostoma spp to pyrantel in dogs, probably with cross-resistance to levamisole. But it seems that it is not a worldwide problem. So far there are also no reports on resistance of lice and mites of pets to parasiticides. Resistance of fleas to old veteran insecticides is very common worldwide. But there are no commercial drenches for pets against fleas with such insecticides. Consequently, if a particular drench doesn't seem to work on your pet, resistance is very unlikely to be the reason. Most probably the product was not appropriated, or the dose was insufficient, or something went wrond during administration. Drenches administered to the pets bear no safety risks for pet owners. Obviously they must be kept away from children, as any other medicines. 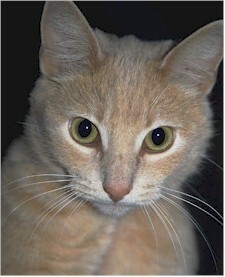 However, there is no problem for children to play with pets that have been recently drenched. It is obvious that such veterinary medicines are not intended for and should never be use on humans!!! For dogs and cats, the major safety risk comes from administration errors. Dosing errors are more likely to occur in multi-pet households: dog-only products may be administered to cats, or small dogs may get the dose for a large one, etc. Or a dog-only product may be erroneously administered to a cat. It is important to actually weight the pets, especially the dogs, because most dog products are dosed by weight-ranges. A small error in weighting may result in the pet falling into a wrong weight range and getting twice as much than the recommended dose or only half of it. This can result in adverse drug reactions or product failure. First reason. Some dog breeds do not tolerate well macrocyclic lactones (and other veterinary medicines such as emodepside). For such dogs a slight overdosing can cause severe adverse drug reactions. This is the case for Collies and related breeds, which have a mutation in the MDR-1 gene that affects the blood-brain barrier and makes it more permeable to such compounds than in the normal case. Besides Collies, other dog breeds have shown similar problems, although the MDR-1 mutation has not been confirmed in all of them. The breeds more affected by this mutation are (% frequency): Collie (70%), Long-haired Whippet (65%), Australian Shepherd (50%, also mini), McNab (30%), Silken Windhound (30%), English Shepherd (15%), Shetland Sheepdog (15%), English Shepherd (15%), German Shepherd (10%), Herding Breed Cross (10%). Other less affected breeds are: Old English Sheepdog, Border Collie, Berger Blanc Suisse, Bobtail and Wäller. The only way to be sure that a dog is affected or not is to test for it. As more dogs are tested it is likely that the mutation is discovered in other breeds, or that the frequencies change. Second reason. Most products with macrocyclic lactones are effective against heartworm larvae in the blood. Heartworm infection (Dirofilaria immitens) is a common disease in dogs in regions with hot or mild weather. The disease is called dirofilariasis. It is transmitted by mosquitoes. It is less frequent in cold regions but can occur there as well. Cats can be affected too. Heartworm preventatives hinder larvae (microfilariae) in the pet's blood to complete development to adult worms. But they can also kill some adult worms, if not all. Now, dead adult worms or their rests in the heart or in the pulmonary artery can obstruct the pulmonary blood vessels with the consequent damage to the lungs, which can be fatal for the pet. This means that any dog that is treated with a macrocyclic lactone should be checked for already existing heartworm infection. If the check is positive, the heartworm infection has to be treated with other specific heartworm products under strict supervision of a veterinary doctor.